1 Year Warranty - Quality with a Guarantee. Your purchase is backed by responsible customer service; please contact us without hesitation if you have any question. 1. Please connect the device to the direct USB port on your computer. If you connect it to a USB hub or extension cords, it maybe cannot recognize the driver or read the CD/DVD. 2. For the desktops, please connect it to the USB port of the motherboard for normal use. 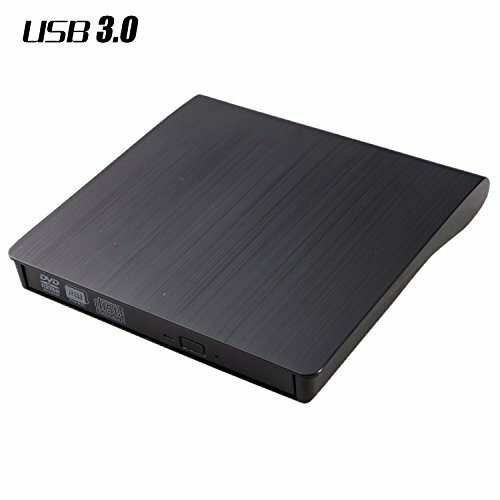 USB 3.0 Interface: Features USB 3.0 technology for easier and faster data transfer, providing more stable performance, while being backwards compatible with USB 2.0 and USB 1.0. Size: 5.7 x 5.7 x 0.62(in), an ultra-slim, lightweight body makes it easily portable, allowing you to carry it in your bag anywhere. Advanced Burning Technology: Adopted intelligent burning technology, features strong error-correcting, anti-shock and noise reduction ability, it allows playing/copying/burning movies and music with no lag. You can read/write/burn your disc or interrupt recording at your ease. Plug and Play: Powered by USB port, no external adapter needed. The DVD drive and the USB cable are combined in one, easy for storage. Never worry about losing the USB cable. Great Compatibility: Compatible with Mac OS, Windows and Linux systems, such as Apple Macbook, Mac, Mac mini, iMac; Windows 2000 / XP / Vista / Win 7/ Win 8/ Win 10 notebook, laptop, PC, desktop such as Dell, Acer, Sony, HP etc. Note: Please don't use USB hub when you use this product, the part power supply divided from the USB hub is not enough. Please insert this drive into the USB connector behind power host if yours is a desktop. If yours is a notebook, just insert it directly, the drive will install itself, then you can read or burn your CD or DVD. 1 Year Warranty - Quality with 100% Guarantee. Your purchase is backed by responsible customer service; please contact us without hesitation if you have any question. If you have any questions about this product by LEADSTAR, contact us by completing and submitting the form below. If you are looking for a specif part number, please include it with your message.